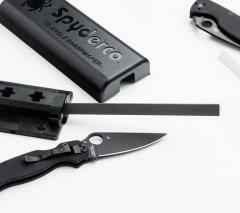 A great easy to use ceramic sharpener kit. A dull knife is no good, the Triangle Sharpmaker makes keeping an edge real easy even if traditional whetstones seem hard to use. Packs neatly into handy little carry box. Carry case, doubles up the stand for the ceramic rods. Two medium grit ceramic rods (brown). Two fine grit ceramic rods (white). Two metal rods to protect your fingers. User manual, very detailed and well illustrated. Instructional video on CD, even better than the paper manual, watching this will teach anyone the basics of sharpening! 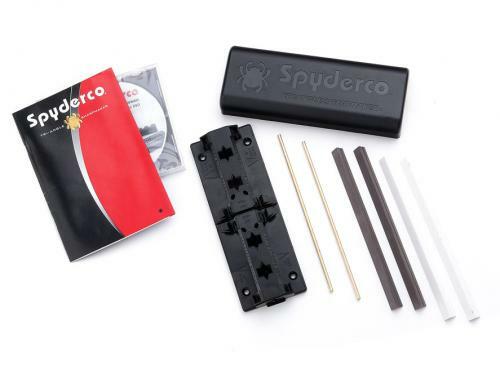 Open the box and assemble theSharpmaker using the correct ceramic rods (start off with the brown ones) and insert them into the slots for the angle you want (30° or 40° for knives, 12,5° for scissors or flat for "free hand" sharpening). The "thing" about the Triangle Sharpmaker is in the ease of keeping the correct angle, you simply push down the knife along the rods, if you want to fine tune the angle you can naturally tilt the blade a little. This makes keeping the angle very easy, which is very important when sharpening knives! 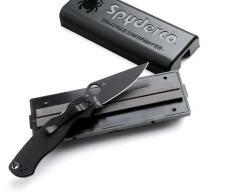 Finish off the sharpening process with the finer white rods and you are good to go. Serrated blades can be sharpened using the corners of the rods, hooks and other oddities can be sharpened using the furrow running along one side of the rods. These ceramic rods are meant to be used dry, do not use any lubricants, oils or water!